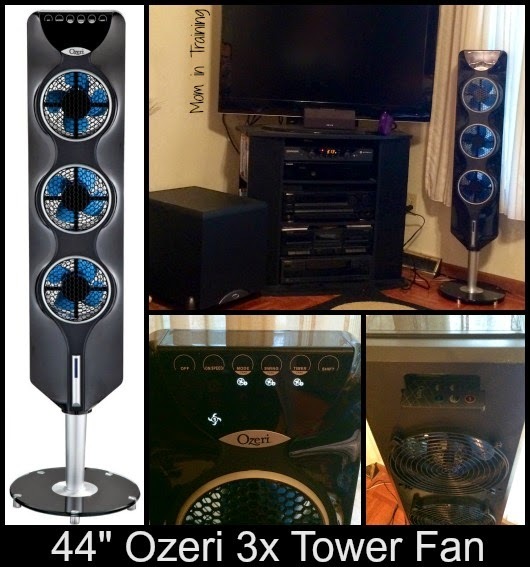 The Ozeri 3x Tower Fan not only looks great in my living room, it feels great too! One thing I've always hated about having a fan in my living room was how it would stand out like a sore thumb and just look out of place. With my new Ozeri 3x Tower Fan I don't have to worry about that anymore. It has a nice sleek look that's tall and slender (a mere 3" thick) with a black glass base to finish it off, and keep it sturdy on the floor. Most of my wood furniture and electronics are black so the fan fits in perfectly. With three independently controllable fans you have full control over just how much air you want blowing and how fast. It also features three pre-programmed airflow patterns designed to foster sleep, relaxation and comfort. The 90 degree whisper-quiet oscillation gives you the ability to cool not just what's directly in front of the fan when stationary, but also a nice span from side-to-side. If you like to have a fan on when you go to bed, but don't like to leave it on all night the 7.5 hour timer is perfect because it can be programmed in 30 minute increments. The other great part is the remote that can be conveniently stored in the back of the fan itself when not in use. I love having a place for the remote instead of it just hanging around my living room and hoping I'll be able to find it next time I want to use it. Through the extended-range remote you can access all of the fans functions too making it super convenient to use from anywhere in the room.